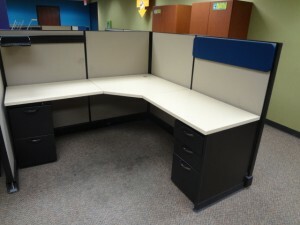 These used Herman Miller AO2 6×6 cubicles are a staple of the contemporary office. We have over 500 units like this, which feature black accenting and Pedestals (both F/F and B/B/F). The stark contrast between the crisp white and the matte black umber color make give this cube unit a minimal appeal that is quite modern. The straw fabric helps bring in neutral tones so it matches virtually any preexisting design. Every panel is 36 inches wide with two 36 inch returns. The partitions measure 53 inches high. No Comments on "Herman Miller AO2 6×6 Used"